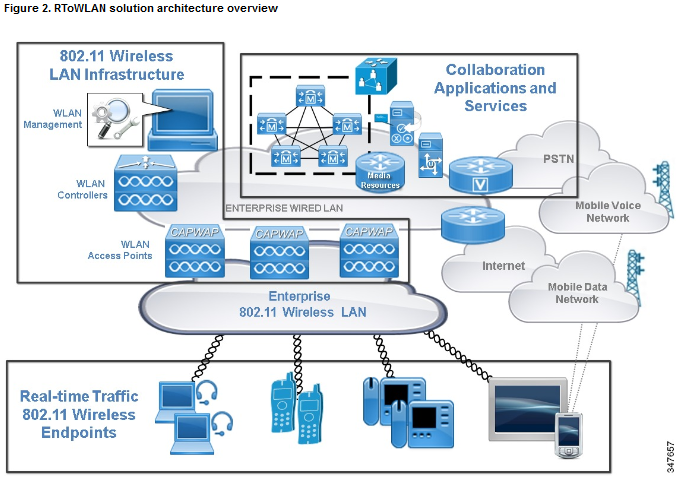 Cisco has released a new design guide named ” Real Time Traffic over Wireless LAN-RToWLAN” to replace the existing enterprise Mobility 7.3 Design Guide. Here is a snapshot of the RToWLAN solution architecture describe in this guide. I think it is based on 7.5.x software release of Cisco controllers. This should be a good reference document if you are deploying Real-Time applications over wireless including voice/video. Rasika, thanks for finding this guide, I completely missed it. It’s intention is to replace the VoWLAN 4.1 Design Guide of old. Thanks Vic for highlighting this, I have posted a correction note in the above.